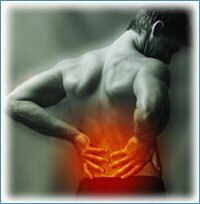 Home » Injury Rehab » Glucosamine or aerobic exercise for back pain? Glucosamine or aerobic exercise for back pain? If given the choice of taking a pill or exercise, you’ll probably choose the pill, right? Exercise requires time and effort while taking a pill is easy. People suffering from back pain caused by bulging or herniated discs symptoms want immediate relief and exercise is the last thing on their mind. So, it’s on to the medicine cabinet. Aspirin, ibuprofen or acetaminophen are the usual pain meds of choice. And they do a good job of reducing pain. But be careful because they all have serious side effects. Ibuprofen can cause high blood pressure and acetaminophen is hard on the liver. Apart from pain meds, there are also supplements that are advertised to reduce back pain. The most well-known being glucosamine. Glucosamine is a compound that makes up cartilage in joints. Remember, discs are made of cartilage. As a dietary oral supplement, mostly from animal or fish origin, glucosamine is often used by patients with herniated disc symptoms, possibly because they believe it will regenerate the cartilage in their discs. This logic isn’t far from alchemists of the Middle Ages who tried to turn lead into gold. A recent study in Norway found that glucosamine was no better than placebo at reducing pain-related disability in people with back pain. I suggest skipping the glucosamine and try aerobic exercise and stretching instead. I know this is the last thing someone suffering from back pain wants to hear, but it has proved true for me. Use the stair climber at your gym to get a fast, low impact exercise. Warning: Jogging is not great for people with back pain. After you’ve exercised, your muscles will be warm and receptive to stretching. There are many stretching exercises you can do. If you’re suffering from low back pain, lying on the floor and stretching your hamstrings is a great exercise. This not only loosens up your hamstrings but lower back muscles, too. This is essentially what a chiropractor does when he or she manipulates your legs. Once these muscles are loosened up there is less pressure on your discs and you feel better. Upright lunges are also great for stretching hamstring muscles. Lunges stretch the calf muscles of the front leg and the quads of the rear leg. And this in turn relaxes the muscles of the lower back. So, next time your back is acting up, forget the glucosamine and possibly the ibuprofen, and instead get some exercise and do some stretching. You’ll be amazed at how much better you’ll feel. Before starting any exercise regime, always check with your doctor first.